Google Wave is a program that allows real-time collaboration and communication in an extremely flexible and fluid environment. In a sense, Google Wave is like a real-time Wiki program where others can edit things already posted and create new items and links through embedding and external applications. Unlike some other similar programs, you can actually read what everyone is typing in the “Wave” in real-time and Goolge Wave is both cross-platform and open source. 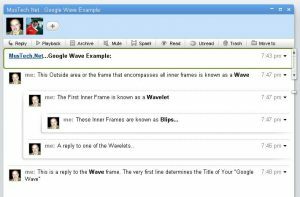 The real power of Google Wave for educators (or others) may very well come with its ability for each “Wave” to be embedded in other Web sites, blogs, and Internet programs. In one of my experiences with Google Wave I was able to be a part of a shared “Wave” with over 100 people using it at simultaneously. While this was quite chaotic, it did work and did not crash either. This was a first-of-this-kind of experience for me with regard to the number of people accessing this type of program at the same time…very interesting indeed. 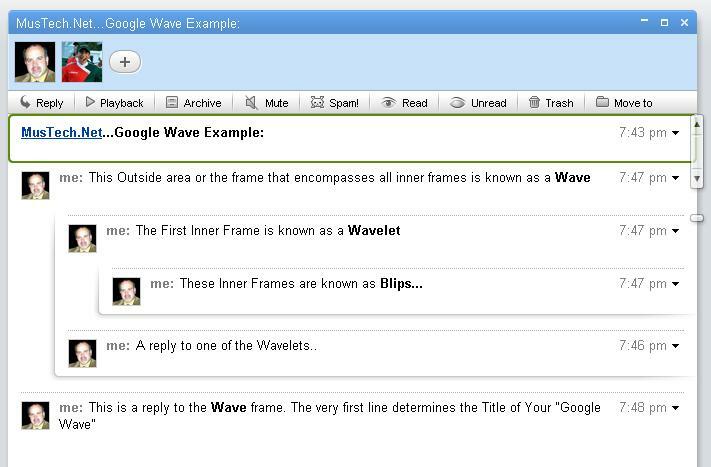 Wave: An entire log or conversation that is created using Google Wave. A Wave encompasses all of the conversations within the initial topic and is threaded. Wavelet: A sub conversation within a Wave. There can be many Wavelets within a Wave and are threaded as well. Blips: Are conversations within a Wavelet and are threaded also. Extensions -Gadgets and Robots: A gadget is an application such as a Google map or any of the “iGoogle” gadgets that are available that can be executed inside of a Wave: A Robot is an automated “helper” that will automated tasks for you such as changing words (swear words for example) to other words or automatically linking text such as @pisanojm to @pisanojm. SPACE key -Allows you to cycle down through UNREAD messages ~VERY USEFUL! CTRL + E -Edit a message ~VERY USEFUL! SHIFT + ENTER -Reply to a message and/or finish (DONE) a message that you’ve typed ~VERY USEFUL! Here is the link to the Official Google Keyboard Shortcut Help File. I will be posting more of my experiences with Google Wave as I have time in the near future. Please Re-Tweet/Re-Post this so others can find this useful information.